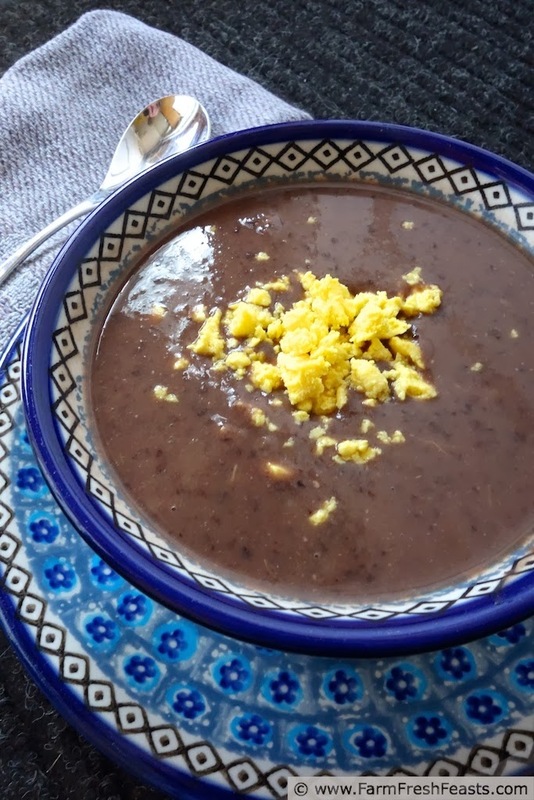 A smooth and elegant vegetarian soup made from humble ingredients--black beans and broccoli stems--finished with sherry and egg yolks. Unpretentious? I'm not talking 'bout wine here . . . If you want to be technical, I have had a teeny tiny smidgen of formal culinary training. When I lived in Richmond, Virginia I took a class at a local cookwares store. The class was taught by Nancy Maurelli and was all about Bean and Grain Cooking. That's where I first tasted this soup--and I'm a packrat kept most of the class handout through seven moves. Key word--most. The internet is an amazing thing. From that stapled class handout I'd removed the page with this recipe since I kept fixing it for my spouse during our early years together. I had the rest of the handout, which included Nancy Maurelli's name, so I started a quest to find Nancy and see if she still had the recipe. In 2008 that quest paid off (interestingly, through the Local Harvest website where you can find Community Supported Agriculture [CSA] farm shares and other local foods near you) and now that the recipe is back in my clutches, or at least the clutches of my Recipes email folder, I won't lose it again. This post is merely planned redundancy. Since I've been reading about Julie's experiments with Roasted Broccoli Stem Dip and Meghan's experiences with Broccoli Stalk Pesto, I thought I'd share this soup. It tastes wonderful and presents so beautifully. The idea of garnish on a soup was awfully high falutin' to me at the time, and still is to be honest, but I do it anyway--it's easy and fun. I can't say that my kids love it--though they do eat a small bowl when we have it--but that's OK. Coupled with a mushroom appetizer such as my Skillet Mushroom Dip for Two or Soy Sriracha Roasted Mushrooms, this makes for a lovely "just for adults" Valentine's meal at home. Add a steak and/or a salad if you like, though don't get too full for Love! If I suggested one of the desserts from my recipe index and intimated that we'd be eating it this year for Valentine's day I'd be lyin'--my spouse wants Killer Brownies and I love him so that's what I'll get for dessert. Perhaps with some Salted Caramel Ice Cream. 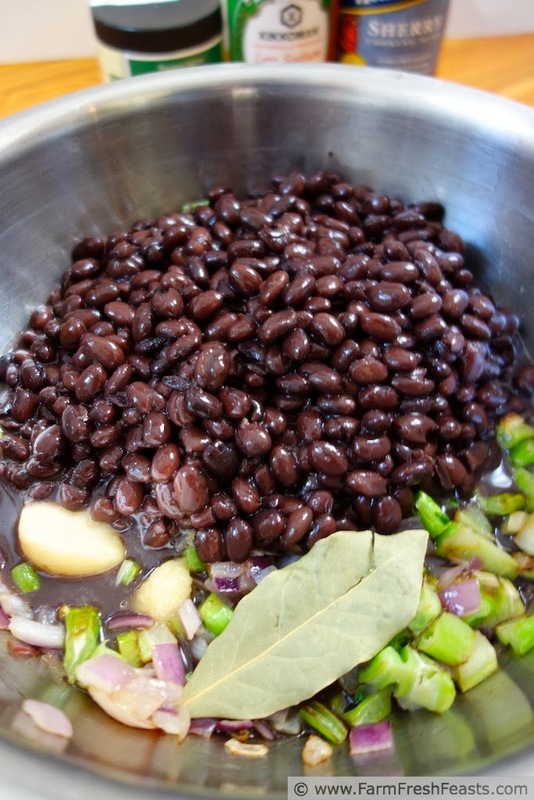 For more recipes using black beans, please see my Beans (Legumes) Recipes Collection. For more recipes using Broccoli, please see my Broccoli Recipes Collection. These collections are part of the Visual Recipe Index by Ingredient, a resource or folks like me trying to use up every last stitch (does this metaphor work?) of produce from the farm share box. I'm sharing soup recipes on Pinterest, follow me there. I'm sharing articles that catch my eye on my Facebook page, follow me there. For a curated look behind the scenes of the blog, follow my IG feed. Want to know How to Use This Blog? NOTE: This recipe is not gluten free as written, because I used a soy sauce containing gluten. To adapt this recipe for a gluten free diet please substitute a tamari style soy sauce. In a 3-4 quart saucepan over medium heat, sauté the onion and broccoli stem in a turn of cooking oil until softened, about 5-8 minutes. Add beans, smashed garlic clove (or minced fresh garlic), ginger, bay leaf and 2 teaspoons soy sauce. Pour broth over everything and simmer for 30 minutes. Puree with an immersion blender (my preference) or blender. Stir in sherry then taste and decide if you'd like to add another teaspoon of soy sauce. Nancy suggests pressing the pureed soup through a sieve if you want a more elegant presentation, but I don't mind bean skins. Squeeze a bit of fresh lemon over each bowl if you've got it, or a small splash of lemon juice, then top with chopped egg yolks. Serve. Ungarnished, this soup freezes well. Serves 4 to 6. *Note: This recipe is my adaptation of Nancy's creation. I cut down the recipe to a family serving size, upped the proportion of broccoli stem to beans, use cooked beans not soaked beans, use roasted garlic not fresh, and use soy sauce not tamari. This looks wonderful! Another great way to use up broccoli stems. Pinning! The composting guinea pig Crystal is kind of harrumphing, in a guinea pig sort of way, at the thought of *her* stems being co-opted into soup. Good thing I'm bigger than she is. Great use of broccoli stems, although I'm completely fascinated by the egg yolk garnish. I love garnishes, even if they're high falutin. They make it pretty and this pleases me to no end. Then again, good lighting and colorful food makes it pretty too. I could go for a bowl of this right now. And the ladies are laying for my neighbor's friend, so I've got glorious rich yolks to garnish. Thanks! 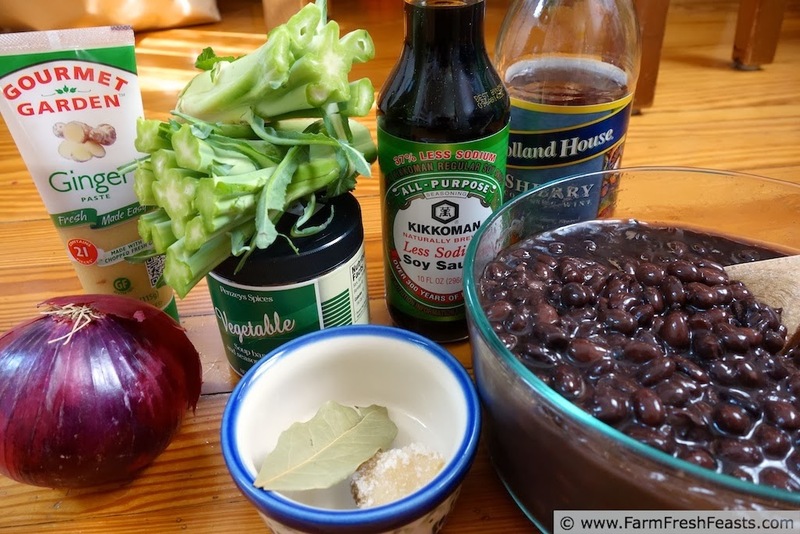 I'm partial to broccoli stems, and I never would have thought to combine them with black beans. I've just gotten a pressure cooker so there are large batches of cooked beans in my freezer now. Will save some broccoli stems this week. I'm envious of your pressure cooker. I borrowed a friend's to do some canning the other summer, but the spouse is not yet sold on the idea of one for the house. Worried about explosions or something. So my crock pot makes beans for us, for now. Thanks! Lovely recipe and great way to use up broccoli stems! The first time I tasted it I knew it would be one I'd make over and over. Why do I never think about stir fry! Such a great catch all dish for whatever I can get out of the crisper!